I am looking forward to my upcoming journey with +Me2 and our other Stuckinplastic friends. I hear we leave on Saturday for 16 days of travel through some amazing countryside. I am not sure what to expect but I am sure some beautiful photographs will be forthcoming. 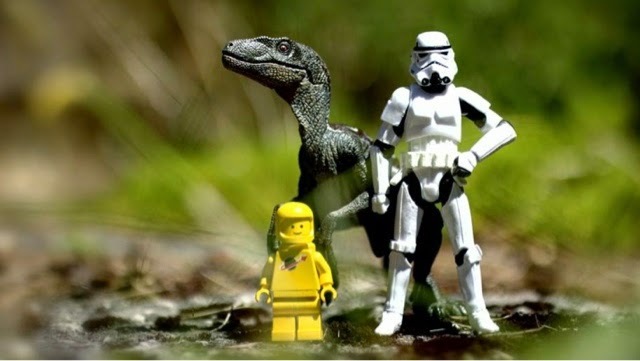 A little closer to home my friend Jon (who you may know by the IG handle of Dinoczars) and I are planning to host a toy photographers meet up in Las Vegas Nevada the weekend of January 16-19, 2015. This event will include an initial meet and greet, two photo outings, time to swap tips and a photo exchange. We have a few more surprises in store depending on the response we get. If you would like more information about the event just click here. 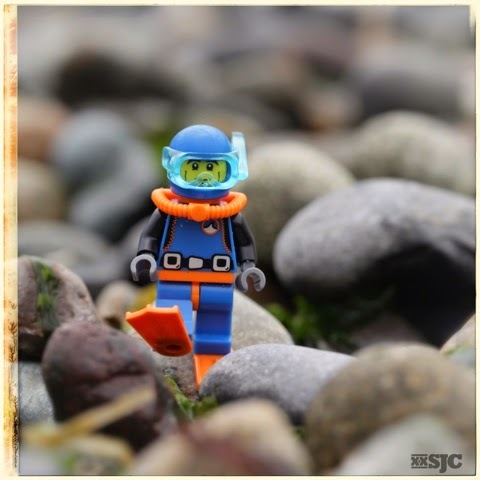 We already have a few brave souls signed up for this epic journey and I am very much looking forward to meeting them in person: Krash Override, Captain Kaos, Papajov, Wikitoybox and of course reconnecting with Bricksailboat. If you have any desire to join us and make this far flung world of Instagram a little smaller and more personable let me know in the comments, G+ or on Instagram. Because in this crazy world that we live in, we need to take every opportunity to make connections and enjoy the time we are given. Which of course means playing more with our toys. As I watch world events unfold in the media I continue to take and edit photographs of toys. This feels a little bit like playing the fiddle while Rome burns. I have no answers to the many crises that face the world right now…all I know is that it all seems to be building at a rather quick pace. Yes, I do know that our world has always been fraught with a certain about of war and conflict – but right now there seems to be a heightened sense of impending doom. It feels as if we are poised at the edge of something ominous and dangerous. Is it right to be spending energy taking toy photographs and trying to creating art that makes people smile? Am I turning a blind eye to the elevated levels of human misery on this planet because it is easier? I have no answers to anything right now. I am not looking for justification to my behavior, but I do wonder if my time could be better spent on a worthier endeavor. Since the toy community spans the globe, do you think about your internet friends who may be in living in danger? Does local or world events effect your work? 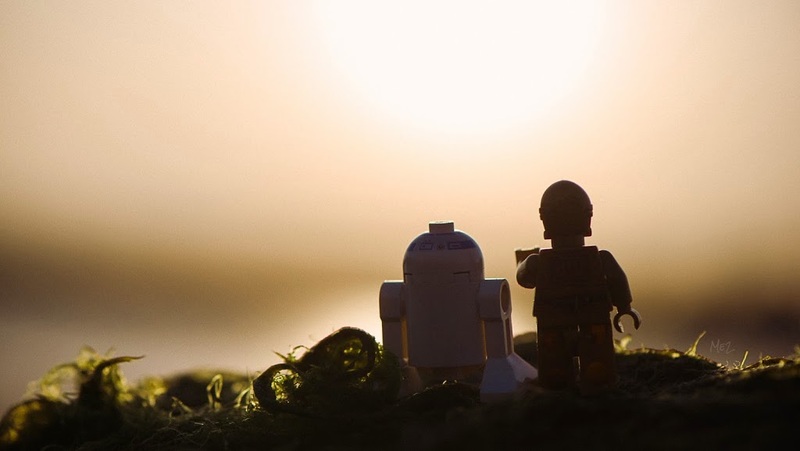 It seems Artoo and good old C3PO are heading to our new adventure and are ready to take the magic hour to the next stage. Will you join in the epic new adventure ? As an artist its’ important to know where you fit in, who (or what) are your influences and who else is working in your field. The biggest advantage being that you can speak intelligently about your craft. In this light I have been trying to educate myself on this crazy field of toy photography and when I find something relevant I can’t help but share it with you. Recently I was introduced to the fascinating and poignant story of Mark Hogancamp depicted in the documentary Marwencol. If you are looking for something to do this weekend I sincerely recommend this movie. 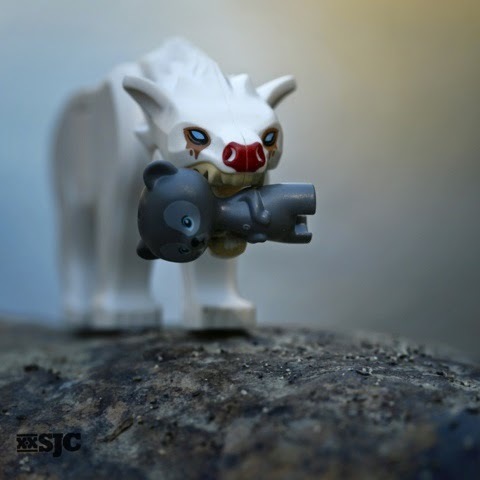 It’s a story about toys, photography, survival and the power of imagination. It also touches on what happens when your hobby is suddenly deemed art. So basically it is completely relevant to anyone who is passionate about toy photography. I found the movie to be profound, touching, heartbreaking and ultimately inspiring. The director handles the subject with respect and because Mark trusts him we are afforded a glimpse into a truly unique world. If you have already seen the movie please leave your comments. If you haven’t, watch the movie immediatly and let me know what you think. If you want to see more of Mark’s photography look here and here. Reality vs the suspension of disbelief is a very strange phenomena in the Lego universe. It’s seemingly arbitrary rules continue to amaze me. 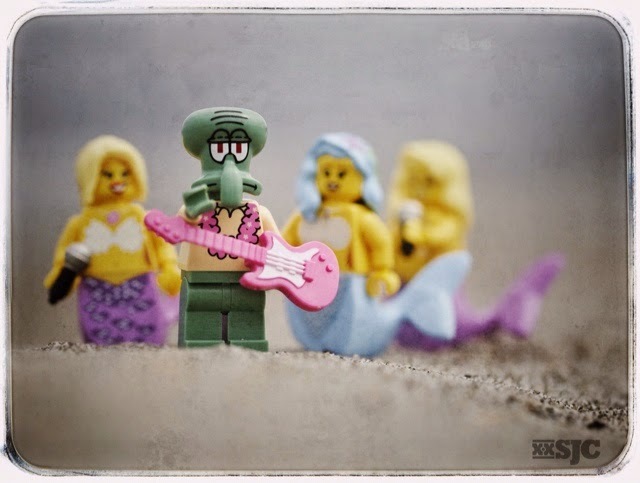 We are willing to accept a guitar playing squid and singing mermaids but not the guitar in a non standard position. The last time I looked, the definition of a guitar is a six or 12 string instrument, not three. What kind of instrument is this really? Does it matter? Is that kind of attention to detail necessary? 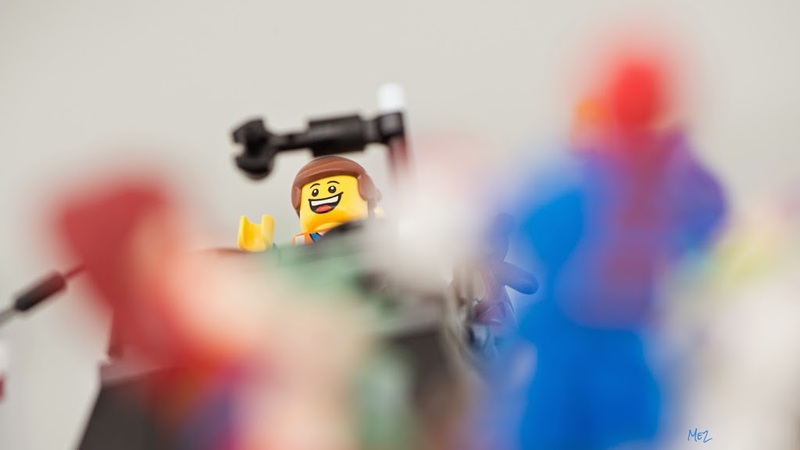 There is a trend within the Lego community for an AFOL (or TFOL) to create a signature figure that represents themselves. I myself have a fairly distinct red headed figure I have used for well over a year that is my Lego alter ego. (She even has her own Lego alter ego.) This figure looks nothing like me…nothing. I was talking to a woman the other day who I have know for a few months. She met me first through Instagram. She told me that on our first in person meeting she was very disappointed to find out I looked nothing like my mini figure; where was my pink hair!?! People take great pride in recreating famous land marks, album covers, particular cars and just about anything else you can think of in the human world with their Lego. 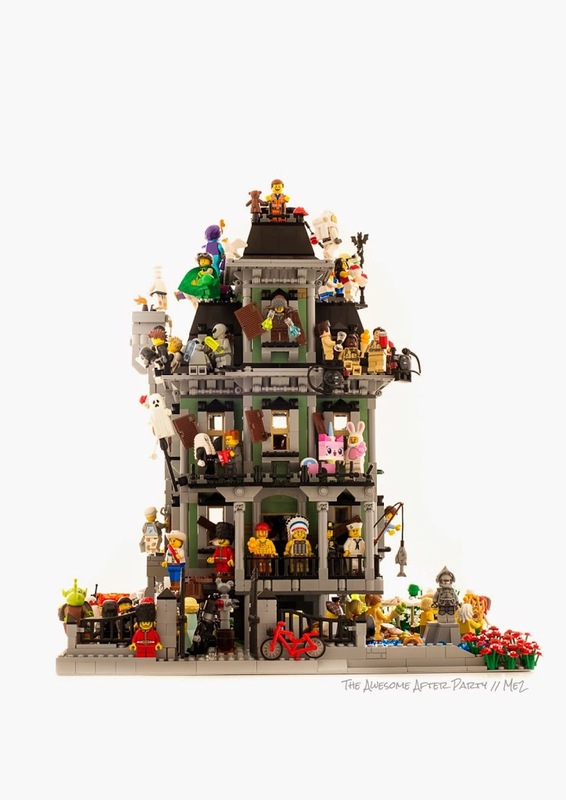 In fact many of Lego’s most iconic sets are based on something in the human world: The VW Bug, The Taj Mahal, The London Bridge, The Lego UniMog …the list goes on and on. But where is the fun in that? How come we can’t make cars that grow flowers or crazy houses that twist and turn, bridges that don’t conform to logic or create a mini figure that looks like who we want to be? Why can we suspend our disbelief about a talking squid and some mermaids but not with an upside down guitar? For all I know Squidward taught Jimmi Hendrix everything he knew about guitar playing. Because in MY Lego world anything is possible. 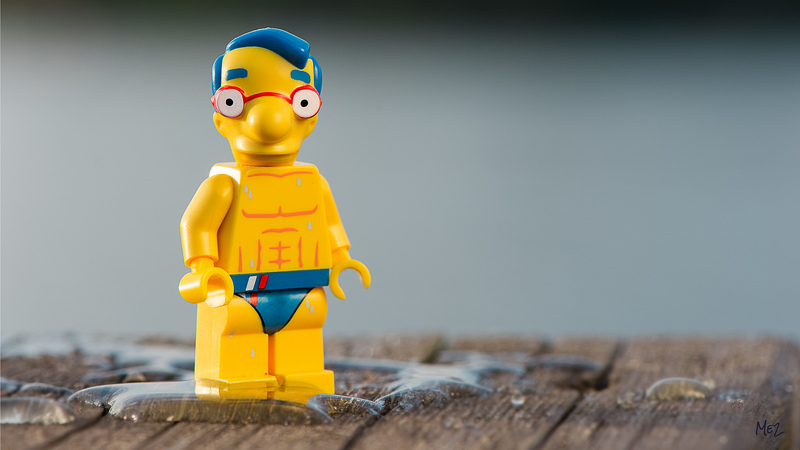 If you have a Lego mini figure representing you, does it look like you? When you create with Lego do you work from photographs or from your imagination? PS – I hope you will check out Gordon’s work on G+ or on Instagram. He creates wonderful, fabulous, unique mech’s – each a thing of beauty that has no basis in reality. By popular demand (read one request) I was asked to review the basics of macro photography. If you don’t know what macro photography is…it is simply the art of taking pictures close up of small objects. 1) Use a tripod or equivalent: When you are focusing on such a small object, camera shake will ruin your focus. 2) You will need additional lighting: Whether you are shooting inside or out, having some additional lighting will allow you take advantage of your full range of f-stop. A ring light, flash (not necessarily attached to your camera) or two small auxiliary lights are all excellent options. 3) Use Aperture Priority mode: when you are shooting closeup you will want to play with how much is in focus for the best effect. A slightly blurred background is a great way to set off your subject and minimize distractions. 4) Use Manual Focus: You should be in control of what’s in focus, not the camera. When you are going for pinpoint accuracy, there is no substitute. 5) Vary the background: You can only have so many shots with blurred green foliage. Be cognizant of your color range. 6) Use a Third Hand: A clever device to have in your arsenal, it can help position a toy or help to add additional interest to your background with color or texture. 7) Use Reflectors: These are easy to make and small enough to carry around. They are a great way to bounce available light onto your mini figs face to minimize shadows or reflective lines. 8) Clear your surface: Stray leaves, grass, pebbles, pine needles etc may not look like much when you are shooting, but once you enlarge your photo they become huge distractions. 9) Minimize your figures: When shooting Lego, 1-3 mini figures is more than enough to fill your frame. More than three (which is itself pushing it), can be over whelming. 10) Be aware of where your toys are looking: The slightest change in a head tilt can signal dramatically different emotions. Don’t forget to make sure the face is in focus. For most people being able to connect with the subjects eyes is a way to connect emotionally. 11) Take your time: More than a few photos have been tossed because the hair wasn’t lined up correctly or the pants where a little askew. Review your photos on the screen before you move on and make sure you have caught these little errs. It can be the difference between a beautiful photo and another image on the virtual trash heap. 12) Change your view point: If your photo is just not coming together change your view point. Move above, below or even to the other side of your set-up. Often the image is there, you just have to get the right angle on it. 13) Have fun and don’t be afraid to take risks. This isn’t brain surgery. If you have any questions or anything to add to the conversation please leave a comment. We are all here to learn from each other. Have you noticed how much toy / childhood imagery there is in the art world lately? Maybe I’m just fine tuned to this genre due to my involvement in the Instagram toy photography community. I noticed that at the art show I was recently attending there were more than a few artists working with toy / childhood imagery in a variety of mediums. For example there was the titillating photography using HO scale figures called bodyscapes, the crazy 3-D toy collages by David Burton (seriously check this guys work out) and more HO scale photography by Audrey Heller. But my favorite by far was Joachim Knill’s paintings of imaginary stuffed animals. I first met Joachim many years ago when we both created photography to sell at arts & craft shows. His work has alway been compeling and nicely off kilter. His latest series of paintings is titled “National Treasure”. 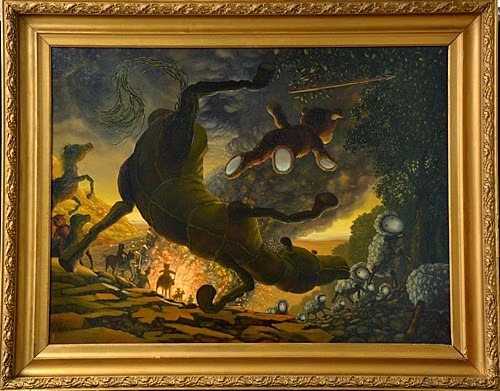 The idea behind National Treasure is that these paintings are artifacts from another world inhabited by stuffed animals. Just imagine a formal gallery that has been dropped in the middle of your street and these portraits of stuffed animals in gilt frames are there to be “shared, viewed and consumed, ” and you might begin to understand the concept. These renaissance styled paintings are slightly disturbing yet endlessly intriguing. They are beautiful haunting images that take me back to my childhood and my own well worn stuffed animals. Talking with Joachim and hearing him refer to his paintings as cultural artifacts was fascinating and certainly rang a familiar bell in my head. I think that whenever you are dealing with mass produced consumer goods in your art work that some aspect of the cultural artifact will naturally occur. It only remains to be seen how you interpret and reflect back your own culture using these ubiquitous objects. Will you become a social commentator, a mirror into the past or create a path into a parallel universe? The possibilities are endless. I encourage you to look around and see what other artists are creating. It feels like there is a brave new world of toy art upon us. Thank you all for your awesomeness ! This is our 100th post here on the stuckinplastic blog and we thought we share some stats of awesomeness with you all ! Our very first post was posted only 4 months ago and attracted a good 17 page views and no G+ recommendation. In average individual posts today get an average of 54 page views and our most viewed individual posting got a good 136 individual page views and 19 G+ recommendations. We accumulated a great grand total of 11K page views. The top countries visiting us are US, Sweden, Israel, UK, Australia, Russia, Finland, Singapore and Belgium. 33% of you awesome people are using windows and another 33% use a Mac and 21% actually likes to visit us from the comfort of their iPhone. And last but not least (and I know some of you will not believe this, including myself), Shelly and Me2 posted each approximate 50 posts each. Thank you all for awesome support the last 4 months. Looking forward to another quarter of awesomeness together with you !